Vitamin D3 5000 IU is rated 4.5 out of 5 by 40. Rated 4 out of 5 by Simba from Good Just started taking the vitamins and so far so good. Rated 1 out of 5 by Nomore from I will not be ordering from Vitamin World any longer. It is too often that I try to order something place my order, only then find out that you don’t. 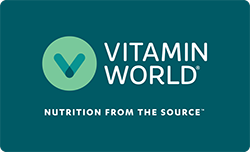 I will not be ordering from Vitamin World any longer. It is too often that I try to order something place my order, only then find out that you don’t. Rated 5 out of 5 by J2018 from Good product Excellent product. I recommend it.